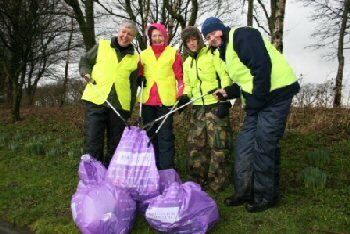 THE CLA in the North has backed a Christmas crackdown on fly tipping by the region's Councils, but wants them to make a collective New Year's resolution to continue the 0 tolerance approach far beyond the festivities. The Local Government Association says Councils will be using powers to issue fixed penalty notices up to ?400 and seize and destroy vehicles used by offenders as part of a:- "pre-Christmas, 0 tolerance" nationwide initiative. The news comes as the cost of clearing up fly tipping in England has hit nearly ?50 million, with Councils having to deal with almost 900,000 incidents every 12 months. On top of this is a further ?18 million is spent annually on enforcement actions. Recent incidents have included old processed waste wrapped in 80 black plastic bales and dumped on land in Sadberge, near Darlington. A similar method of fly tipping was used to stack bale bags on farmland in the Bishop Auckland area. Dorothy Fairburn, CLA Director North, said:- "We receive regular reports from our members of fly tipping, particularly when their land is located on the fringes of urban areas. The waste involved is not just the occasional bin bag, but large household items, from unwanted sofas to broken washing machines, and building materials; even hazardous waste. The estimated average cost to rural businesses of this anti-social behaviour is ?800 per incident and is a continuing and damaging blight on our countryside. In addition, landowners are liable for any waste that is fly tipped on their land and can be prosecuted if they do not clear it away, often at considerable cost to their business. Earlier this year, we welcomed new government regulations which enable local Councils to issue fixed penalty notices or fines of up to ?400 for small scale fly tipping, but this is not enough. We support the LGA's call for a speedier and more effective legal system to deal with offenders more robustly, and urge Councils to exercise their powers in prosecuting fly tippers. The maximum fine is ?50,000 or 12 months imprisonment if convicted in a Magistrates' Court, but this is never enforced. If it was, it might deter fly tippers. Frequently, it costs more to bring an offender to Court than the penalty actually imposed. The crackdown should not just be for the Christmas period, but throughout 2017. This will not only ease the pressure on the public purse, but also on demoralised farmers and landowners who are simply fed up with clearing up somebody else's waste at their own expense." Farmers and landowners are being urged to sign a petition calling for tougher penalties for unscrupulous fly tippers who dump rubbish in the countryside. Fly tipping can be reported to local Councils online via a dedicated website. Waste crime can also be reported in confidence and anonymously to Crimestoppers, by visiting Crimestoppers or by phoning:- 0800 555 111.